The lesson addresses the topic of Energy Markets, its structure and how prices are set looking at energy sector. 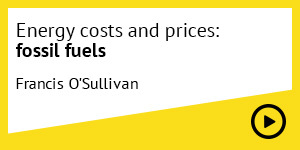 Energy is one of the most important trade of commodity and through this lesson, prof O’Sullivan gives students an idea of how energy markets affect energy prices globally, examining the differences by commodity type, by their origin and how they developed over the time. The lesson tackles in depth three main energy markets. First of all, it addresses the Crude oil market, the world’s most prominent energy market. Secondly, even if smaller than the crude oil market, it analyses the Natural gas one, focusing on the challenges of moving gas. Finally, the last part of the lesson is dedicated to the Electricity Market with a special attention on renewable markets.